In one of my previous posts I showed how to use ADF popup components to display external content such as webpages like wikipedia in an inline frame. Based on this post a colleague of mine tried to display a PDF document. That didn't work. In this post I explain how you can use a servlet to open a PDF document in the inline frame. I will not explain how to invoke popups. If you need to know how to do that, refer to the post mentioned earlier. 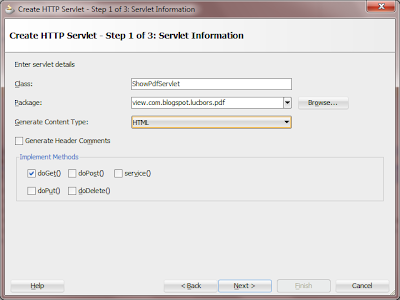 How to create the servlet ? 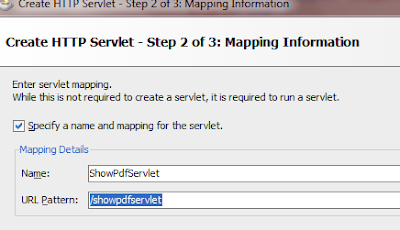 The solution for showing a PDF in a popup is to use a servlet. It's possible to have a servlet deliver PDF content to the browser by specifying the content type of the servlet response to be the 'application/pdf' MIME type via 'response.setContentType("application/pdf")'. 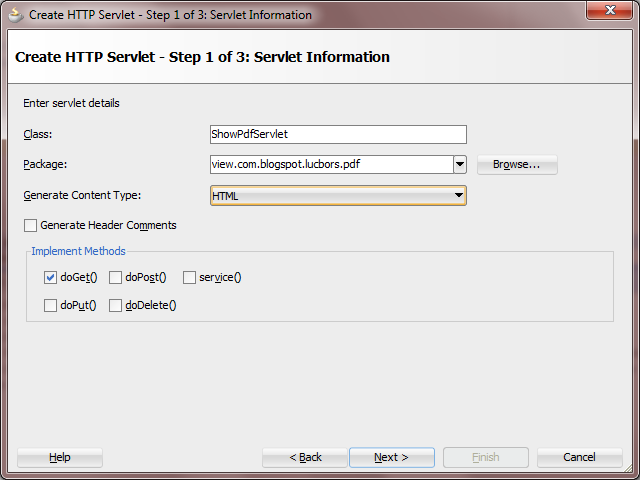 In JDeveloper you can create a HTTP servlet very easy via the new gallery. I decided to call the servlet ShowPdfServlet which actually is a pretty descriptive name for this servlet. For the servlet mapping I accept the default, meaning that all request containing "/showpdfservlet" in the URL will invoke the servlet. The "create servlet" wizard of JDeveloper will make sure that teh servlet and its mapping is added to the web.xml of your application. The servlet will get the filename form a request parameter. So in the servlet I can get this value by invoking getParameter on the request. With this parameter value, and the file path (which I hardcoded for this post) I am now able to create a new File Object. 3:    // Decode the file name (might contain spaces and on) and prepare file object. And now finally get the file and write it to the response. 7:     // Write file contents to response. How to make sure the servlet is invoked ? Remember the servlet mapping that I used earlier ? Now I will use this to make sure that I invoke the servlet every time I open the popup containing the iframe. I simply make sure thate the source of the iframe to contains the path that I use in the servletmapping. I also add a 'name' request parameter and set its value to (in this case) a value that I get from a managed bean (line 7). 4:            title="Extra information for your flight"
6:     <af:inlineFrame id="if1" shortDesc="This is an inline frame"
Now run the application, and invoke the popup. There you go ! What is a servlet ? A copy of the workspace can be downloaded here. This is now possible with a Software Called PDF Pop-up Creator by zeescripts ar http://www.pdfpop.com. It just like a factory where you select your pdf file, and add messages and also optin forms for list building. Great article. Can you please send a copy of workspace to biazhang@gmail.com . I would appreciate if you send the workspace to biazhang at gmail dot com. I have followed the steps given above, and iam able to open the pdf file in a browser when i access url directly using address bar. But when i use the same in popup's inlineframe as shown in this post, MyServelt’s doGet() method getting called multiple times(4 times). please suggest me what would be the reason. 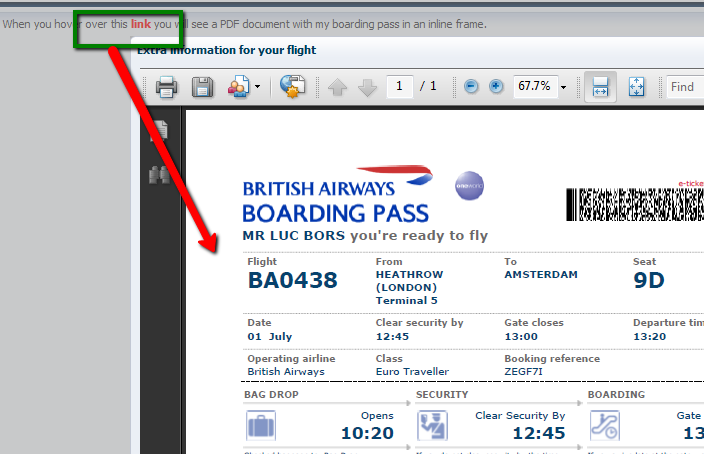 Hi i have implemented pdf in popup in same way as you suggested and its working perfectly on all browsers. I am facing problem in MAC firefox. Its showing loading 0% and not proceeding. However, i have installed a plugin in MAC firefox. I am able to open any random pdf in firefox but not pdf in popup. Please suggest. Thanks in advance!!! Can You please explain if it is possible to stretch the inline frame component vertically? In popup I need to have some other widgets like buttons and radio buttons shown on the top of the popup window and bellow it should be preview part. I tried using a panel stretch layout and have put the inline frame component in the center facet (other widgets in the top facet) but the inline component simply refuses to stretch vertically.